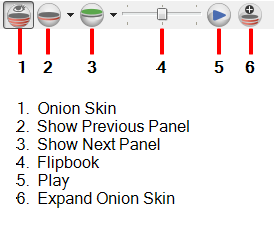 With onion skinning, you can display the drawings from previous panels in the current panel, so you can see where to place the drawings for the next panel. You can also display drawings from next panels in the current panel, so you can see where to place the drawings for the previous panel. 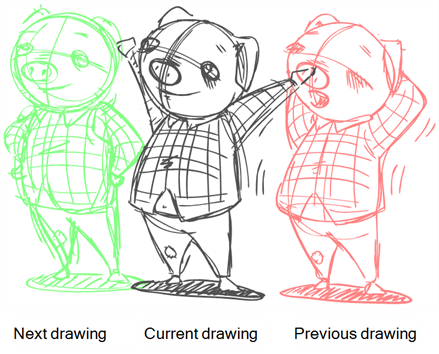 You can use these drawings as a reference to determine the size, angle or position of the drawing in the current panel. To learn more about the Onion Skin preferences, see Setting the Drawing Preferences. You can access the Onion Skin feature using the Onion Skin toolbar. ‣ In the Onion Skin toolbar, click the Onion Skin button. ‣ Press [Alt]+[O] (Windows) or [⌘]+[Alt]+[O] (Mac OS X). ‣ Select View > Onion Skin > Show Onion Skin. The previous panel(s) appear in the Stage view. NOTE: You can also select these options from the top menu, View > Onion Skin. The next panel(s)appear in the Stage view. Storyboard Pro makes use of a flipbook feature for rapidly moving between onion-skinned drawings. This is an extremely useful and time saving feature. ‣ Adjust the flipbook slider to flip between the drawings you selected with the Onion Skin tool. ‣ Click the Play button to automatically play the onion-skinned drawings as a flipbook. You can expand your Onion Skin to show more than the default three previous and three next drawings. Using the Expand Onion Skin option, you can see some or all of the 15 previous or next drawings. ‣ In the Onion Skin toolbar, click the Expand Onion Skin button. Note that the numbers you select in the Expand Onion Skin dialog box will be retained and used as the default Expand Onion Skin values. You can set the default number of available Onion Skin levels in the Preferences dialog box (Camera tab).